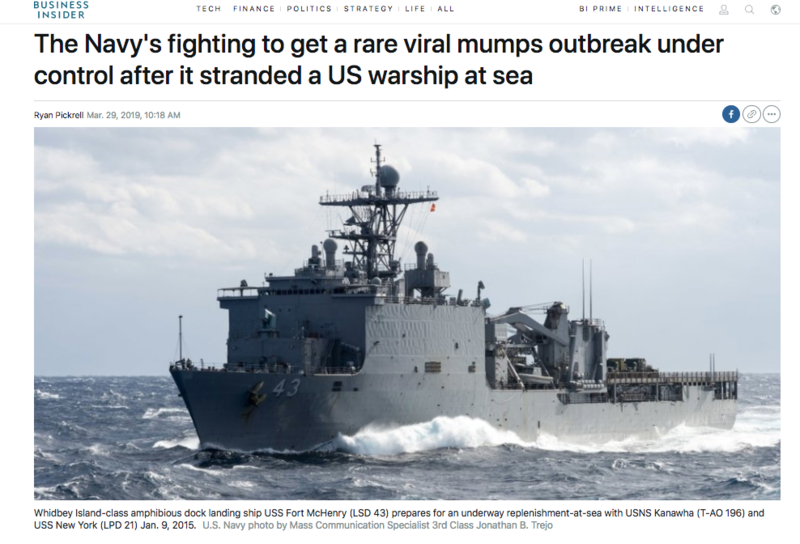 Below features excerpts from the recent article posted by Business Insider regarding the mumps outbreak on U.S. Navy ship USS Fort McHenry followed by a personal response from Dr. Dale. “It is not common for us to see outbreaks of vaccine-preventable viral infections,” the Navy’s Bureau of Medicine and Surgery told BI. Dr. Dale: Actually, it is very common for our society to see outbreaks of “vaccine-preventable” illnesses due to fraudulently designed and approved vaccines. “Vaccine-preventable” is quite the oxymoronic statement when you realize what the science shows regarding the effectiveness of many vaccines. Three examples of this phenomenon are flu, whooping cough, and mumps. In regards to mumps specifically- All current outbreaks are occurring in fully or near-fully vaccinated communities. Take the outbreak of mumps that hit Fordham University where it was confirmed that all students that contracted mumps were vaccinated. Or how about the 25 confirmed mumps cases at the University of Minnesota in 2017? All individuals there who contracted the mumps were vaccinated. Why is this happening if vaccines “work”? Well to break it down simply—Merck lied. Two of Merck’s very own scientists came forward more than a decade ago and attempted to alert the FDA that they were committing fraud. They way they were doing so is described in detail in a court case filed in 2010 that is STILL going on to this day. Merck has no defence for lying and even when so far as to use RABBIT BLOOD in their study to “artificially” inflate the appearance of an effective vaccine. All said and done, Merck was able to effectively monopolize the US Mumps/MMR vaccine market with an ineffective vaccine. Viral parotitis is an infection of the saliva glands on either side of the face that’s typically caused by the mumps. … “based on clinical presentation and laboratory testing, these cases are currently classified as probable cases of mumps,” one of a number of illnesses that all US military personnel are vaccinated against. … “Since the onset of the first case, the ship’s medical department has implemented health protection measures, provided an additional outbreak-specific dose of vaccine to the crew, and managed patients to stop the spread of the illness,” BUMED explained. Dr. Dale: So because Merck fraudulently monopolized the Mump/MMR market by committing more fraud and lying about the mumps/MMR effectiveness, when their vaccine does NOT work, they get to profit more because our government buys another vaccine, that also doesn’t work. …Complications from the mumps are rare but can be life-threatening. Dr. Dale: The mumps virus is exactly what they are saying here. Mumps is a harmless illness that on extremely rare instances will be the proverbial “straw that breaks the camel’s back” sickness. The reason I say it this way is that it is not the virus that causes that. It’s never the virus that kills someone. It is the condition of the host that determines the outcome. It is well established that while malnutrition is the primary factor, there are other factors such as the state of the nervous system, health of the gut, etc., that leads to the poor or the rare life-threatening outcome during an infection. BUT if we understand what this vaccine has actually done, it can be seen that the vaccine has actually shifted the disease burden of mumps from a harmless illness in children to a disease more severe and life-threatening to the adult population. The answer here is not going to be more of “what caused this horrendous situation” as opposed to this being worthless vaccine that doesn’t work and shifts the burden of illness to an age that is riskier. As of March 9, just a few days before CNN first brought the story public, 25 service members aboard the Fort McHenry had fallen ill. By March 17, Fifth Fleet had informed BI that all 25 affected personnel had made a full recovery and returned to duty. A new case popped up last Tuesday, CNN reported at the time, and since then, the number has risen again. Dr. Dale: If the health and welfare of our services members are so “paramount”, then why is our government giving them a vaccine that is being criminally investigated? In addition to making the decision to quarantine the ship at sea while sick servicemembers received treatment, the Navy, exercising caution, also gave all of the more than 700 service members on the Fort McHenry booster vaccinations for measles, mumps, and rubella. Dr. Dale: Even with every member quarantined on the boat being vaccinated, they still contracted the mumps. Moreso even after they all received a recent booster, individuals are STILL coming down the mumps. Why can’t the medical community and government admit that this is a junk vaccine? Think about it. Every outbreak currently occurring is in fully-vaccinated or highly-vaccinated communities and campuses. Dr. Dale: They mention that outbreaks of influenza are common as well, yet the military is given annual flu shots basically as soon as the new flu vaccine becomes available for the given year. If the influenza vaccine worked, which it doesn’t, then a completely isolated “community” or group of people should have the greatest “herd” immunity possible. However, we see that outbreaks of the flu are common. The point is, what we are being led to believe about vaccines is far different than reality and the truthful science. …The ship hasn’t made a port call since early January and now isn’t likely to for at least another month — a very long stretch at sea that’s a morale killer for the crew. Dr. Dale: Do you know what really hurts my moral? The fact that we allow Big Pharma to get away with crimes and fraud regarding their drugs and vaccines, which ultimately leads to our service members becoming sicker and our children being the sickest of the entire child population throughout the “industrialized” world and the fact that our government isn’t upholding real justice when these crimes are committed. Merck should have been found guilty long ago. Yet they are “stonewalling” the court system because every day they delay is more money in their pockets. Think about it! Merck has been stonewalling the court system since 2010. Given that more than 3.8 million children have been born in the US in 2015, Merck has profited close to $2 Billion each year when you account for all the children and military that have been given their non-effective Mumps/MMR vaccine. …It is difficult to know how long the Fort McHenry’s ongoing quarantine at sea will last as a situation like this cannot be considered fully resolved until two full incubation periods have passed without incident. “This ensures that the virus is no longer spreading, as infected individuals sometimes show no symptoms of illness,” BUMED said. Dr. Dale: This is quite the admission of a lack of “faith” in the vaccine they have. If the vaccine was effective, then why would they not be confident that within a single incubation period, the outbreak would be over? The vaccine does NOT work. Merck lied and committed a crime. I feel that our soldiers, sailors, and especially our children, no longer deserve to be injected with a criminal’s fraudulent product. …For the mumps, the incubation period is 25 days, so it will be another 50 days after the last affected servicemember recovers before the Navy can declare the situation under control. Chatom vs Merck Lawsuit. Mumps/MMR vaccine fraud lawsuit.